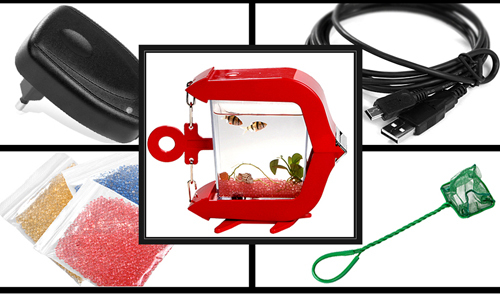 Fishtank Friday: Comfish USB Aquarium | OhGizmo! Raising a fish is hard work. Comfish understands that “most people feel that the precise care of tropical fish is time consuming, requires expertise and is expensive and thus most of us shy away from owning their own aquarium.” The solution? The Comfish aquarium, which is controlled almost entirely from your computer. A USB cable supplies power to the tank’s LED lights, the water heater, and the oxygen pump (bubbles! ), and you can control all this stuff with a program that looks just like the fish tank itself. A little camera in the tank displays what’s going on inside the virtual fish tank on your computer, so you never even have to look at the real fish… Besides having to feed them and clean the tank and stuff, of course. It’s also a room humidifier and a night light, and will cost you about $50, in Korea. “A little camera in the tank displays what’s going on inside the virtual fish tank on your computer, so you never even have to look at the real fish… ” Whats the point? If you really don't want to look at the “real” fish why not just get a virtual fish program on your computer. Would save the real fish from suffering in such a stupidly small tank. wow that's just really wonderful aquarium, such a small one but i like it. that's just wrong! The fun of keeping a tank is in taking care of it. This just makes an aquarium a fixtures, like a picture on the wall. Oh well, to each his/her own I guess.